Salesforce is the #1 implemented Customer Relationship Management system and is one of the leading cloud-based solutions on the market today. Salesforce gained more market share than the rest of the 20 largest CRM suppliers combined in 2017, according to IDC. 3.3 million new jobs are expected to be added in the Salesforce ecosystem by 2022, meaning huge opportunities with top clients, exciting projects, and higher daily rates. 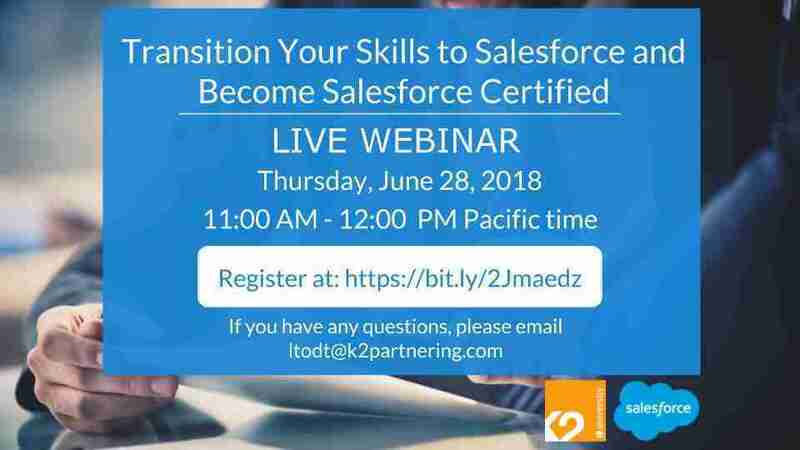 Join us on June 28, 2018, for our free webinar to learn more about what Salesforce is, and why you should transition your skills to Salesforce today. We’ll also show you the learning paths you can take to help you become a Salesforce Certified professional – no matter your background. At the end of the webinar, there will be a Q&A session. Follow us on LinkedIn for all the latest SAP and Salesforce news, along with career tips and upcoming course information!